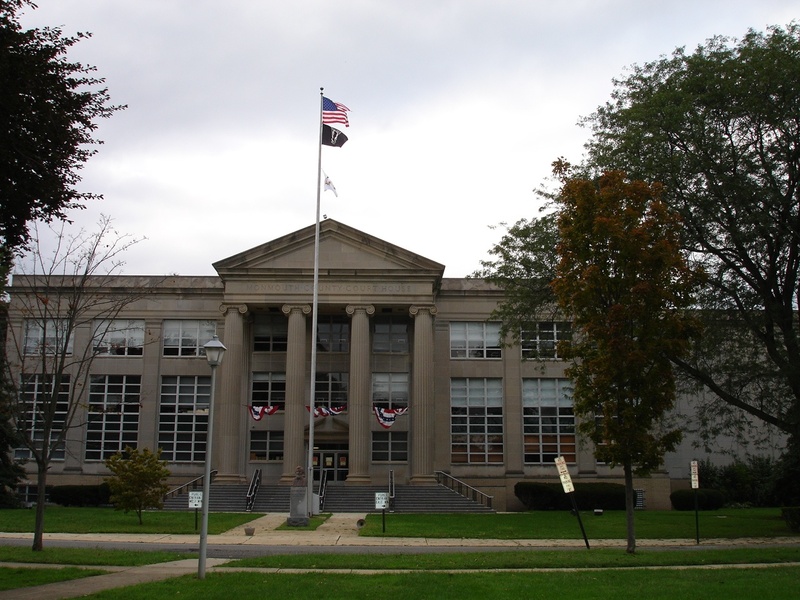 This article will introduce you to some of the facilities at the Monmouth County Court House so as to make your experience there more comfortable and less stressful. The front door to the Courthouse is locked, and only Courthouse staff can get into the building from the front, which is the South Wing, and which is close to the large flagpole. Non-courthouse employees must enter through either side door, one at the West Wing and one at the East Wing. To determine which is the West Wing, which is the East Wing, and which is the South Wing (there is no North Wing), one would look at the Courthouse from the parking lot behind the Courthouse. There are two parking lots on the North side of the building. The first lot (the one closest to the Courthouse) is usually filled by 8:45 am. The second lot is directly behind the first and never fills to capacity. You will always be able to park somewhere nearby. From this angle, on the right hand side of the building one is viewing the West Wing, and on the left hand side of the building is the East Wing. Again, looking at the building from the Monmouth County Courthouse parking lot, you would see a sign at the top of the right side of the building that says "West," and a sign at the top of the left side of the building that says "East." This defines the location of the West Wing and the East Wing respectively. The part of the building that is not labeled is the South Wing. The Monmouth County Courthouse is three stories tall and there are restrooms on each floor. The three stories are supplemented by a basement (known as "Lower Level" with rooms starting with the letter "L"), and then three stories numbered One, Two, and Three. Bathrooms are something that people often inquire about at the Courthouse. Where are they, for starters? More importantly, where is the clean one or the cleaner ones? There are plenty of bathrooms in the building. There is a mens room and a women's room on each floor of each wing. But the newest bathrooms are on the third floor in the East Wing. The East Wing is the criminal wing of the Courthouse. Criminals (and alleged criminals) get better bathrooms than those people who are getting divorced. Sorry… I don't make the rules, I'm just telling you the way it is (LOL). The basement (i.e., the "Lower Level") has many important areas, all of which have room labels starting with "L". In particular, in the basement of the East Wing at the end of the building closest to the parking lot is "Family Reception." This is room L-50. Inside "Family Reception" are mini-courtrooms known as L-52 and L-54. L-52 is usually used for custody hearings between parties who are not married. L-54 is usually used for domestic violence restraining order temporary hearings. Both of these hearing rooms are used by hearing officers, not judges. The hearing officers are lawyers and do not wear robes, as a judge does. There are about a dozen tables with chairs right outside of family reception's L-50 where you can sit and strategize or just relax. There are vending machines there. Walking toward the South Wing of the building one comes to the "Ombudsman" self-help resource center. This is a resource space for people who are unrepresented. Directly across the hall from the Ombudsman is the Monmouth County Bar Association in L-44. This is the home to the Monmouth County Lawyers Association and the Lawyer Referral Service. On the left of that are the court reporters where transcripts can be purchased of any court hearing. In the South Wing is the "Children in Court" office at L-33. They are a group of professionals who try to make the experience of being in court easier for children. Next door at L-30 is "Parenting Time Mediation". This is where parents who have custody and parenting time disputes can come to work with a trained professional to try to work things out amicably, quickly, and inexpensively. In L-24 is the "Family Division Administration." This is where the Family Court Division Manager maintains her office and her staff. L-7 is where papers are filed for the Family Court and money is paid for filing fees. When we finally make our way to the West Wing, we are outside the jury assembly area and the coffee shop. There are a dozen or so tables and chairs here. This is a good place to sit and regroup, grab a sandwich or coffee, and just breathe during a stressful day. Often there will be jurors sitting at these tables waiting to be assigned to trial judges. When you enter the courthouse through either the West Wing (the main entrance) or the East Wing (an entrance that gets less use), you will have to pass through a metal detector. Any unusual objects (pocket knives, for instance) will be taken from you and will not be returned without a court order from a judge. Don't bring anything that you don't want to have taken away by the sheriff. After you pass through the metal detector, the sheriffs are always happy to give you any direction in case you need help finding a particular judge's courtroom or other location in the Courthouse. Just ask the Sheriff after you have successfully cleared the metal detector (you will need to take off all jewelry, remove everything from your pockets, and take off your belt in all likelihood in order to be able to pass through the sensitive metal detectors at the courthouse). The various Family Court judges are scattered throughout Floors 1, 2, and 3 of the Courthouse. Ask a sheriff after you go through the metal detector where to find a particular Judge's courtroom, or you could check the signs near the entranceways. There are conference rooms throughout the Courthouse. The Monmouth County Court House has free public wifi that is fairly strong and easy to connect to. Hopefully this article will help make your experience in the Monmouth County Family Court less stressful.